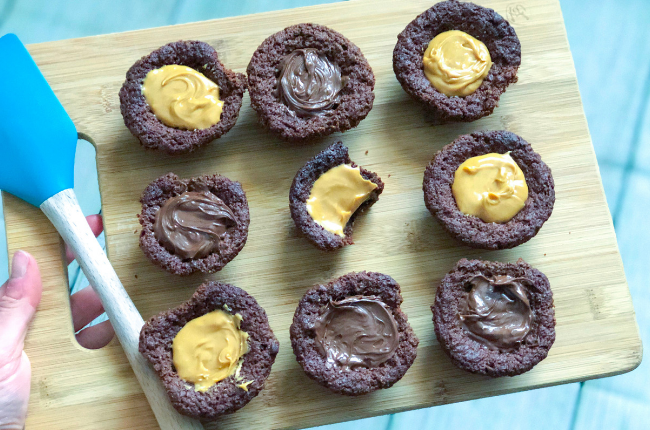 You can’t go wrong with brownie bites and you can’t go wrong with peanut butter (or any nut butter for that matter). That’s why I decided to combine the two! These healthy peanut butter brownie bites are made with mostly clean ingredients and minimal processed sugar. You can enjoy them in 45 minutes or less and are the perfect treat to come home to after a long day at work. I used plant-based protein for this recipe and recommend using the same. Using whey protein may alter the texture and not in a good way. I also added some collagen for an extra boost of protein and added nutrition, but you can omit if you want. Mix dry ingredients until fine and no lumps. Mash the banana and add oil and honey. Mix the dry ingredients with the wet ingredients until you get a thick, sticky mixture. Grease a mini muffin tin and fill with the batter. Bake at 350 degrees for about 15 min. Let the brownie bites cool for a bit and gently remove from the pan. Add a dollop of your favorite nut butter. I did half natural peanut butter and half Nutella. You can store them in the fridge to set the nut butter if you want, or enjoy them while it’s ooey and gooey! If you like this recipe, be sure to check out my Avocado Brownies recipe and Clean Eating Chocolate Chip Cookie recipe!